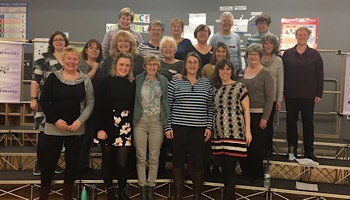 Avon Harmony is among the longest-running all female Barbershop A Cappella groups in the whole of the UK forming in 1974 in Bristol (take a look at our History Page). We attract women of all ages from 18+ with no upper age limit from all walks of life who want to sing and perform at a high standard. We enter the annual LABBS national barbershop competition each October Half Term and perform at regular events throughout the year from Weddings, Concerts, Varied Events and much more. We sing a variety of music from songs from the Movies, West End shows, Contemporary Music, Pop, Retro, Classic to classic barbershop music. From Adele A cappella covers to 40's Classic Numbers like Beyond The Sea, then we have something for everyone and to entertain and delight our audiences. Barbershop music is made up of four unaccompanied parts. The melody is consistently sung by the LEAD line, with the TENOR part harmonizing above the melody line, the BASS part singing the lowest harmonizing line, and the BARITONE completing the chord. These parts can either be sung by individuals to create a quartet or by numerous voices, so forming a chorus of singers. This close harmony is easily recognizable as the unique barbershop sound. We love what we do and want to take the world by storm by booking us, watching us and joining us. We need female voices young and old who can sing in tune who want to come on the adventure with us. Take a look at our Join Us page for more information or give Mary (MD) a ring on 07954 170532. AH rehearse every Thursday evening at Fairfield High School, BS7 9NL from 7.30-9.45pm. Join us. Book us. Support us.